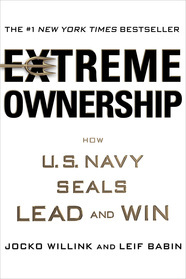 Leif Babin and Jocko Willink are decorated former Navy SEAL officers; co-authors of the New York Times bestselling smash Extreme Ownership: How U.S. Navy SEALs Lead and Win; and co-founders of Echelon Front, where they serve as leadership instructors, speakers, and executive coaches. As SEAL platoon commanders in SEAL Team Three’s Task Unit Bruiser, they planned and led major combat operations in the Battle of Ramadi that helped the “Ready First” Brigade of the US Army’s 1st Armored Division bring stability to the violent, war-torn city. Task Unit Bruiser became the most highly decorated special operations unit of the Iraq War. During their careers, Willink was awarded the Silver Star and the Bronze Star, while Babin is the recipient of the Silver Star, two Bronze Stars, and a Purple Heart. Emerging from the triumphs and tragedies of war with a crystallized understanding of leadership in the most challenging environments, Babin and Willink put their knowledge to use in the business world. After leaving active duty in 2010, the duo launched Echelon Front, a leadership consulting company that helps others build their own high-performance winning teams. They offer unmatched solutions in leadership, strategy, innovation, management, team building, contingency planning, and crisis management developed and proven in the U.S. Navy SEAL Teams. In Extreme Ownership, Jocko Willink and Leif Babin share hard-hitting, Navy SEAL combat stories that translate into lessons for business and life. With riveting first-hand accounts of making high-pressure decisions as Navy SEAL battlefield leaders, this book is equally gripping for leaders who seek to dominate other arenas. Winning the War Within From recognizing the difference between good and bad leadership to learning how to keep your ego in check, Babin and Willink explain how good management helps breed success in the workplace. Laws of Combat In this speech, Babin and Willink explore what makes a good team and reveal methods for building stronger relationships with your colleagues. Sustaining Victory How do you maintain success in the office? Plan ahead, be decisive, and employ discipline—Babin and Willink show us how to anticipate and address any challenges a team might face. Extreme Ownership is highlighted on a list of what Wall Streeters are reading this summer in Business Insider. Leif responds to President Obama’s push to close Guantanamo Bay detention center. Watch Leif’s feature on the History Channel’s “Live to Tell” series.